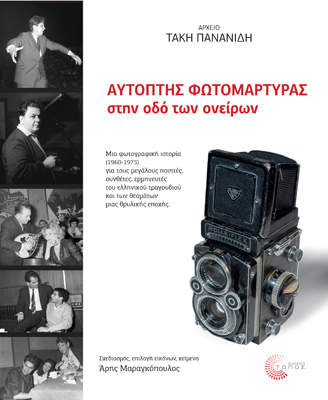 A story of photos that capture a legendary period (1960-1975) with great poets, composers, musicians, singers and actors of an era that still means a lot to the Greeks. A story of photos that capture a legendary era of greek pop music (1960-1975) which still means a lot to the Greeks, and seems to be indispensable to the knowledge of whoever might need to learn more about contemporary greek culture. This photo-story, is based on photos chosen by Aris M. from the Archive of Takis Pananides. Takis Pananides was a well-known photographer who followed consistently the evolution of Greek pop music in the sixties. His photos contribute a lot to the historic and cultural heritage of the period. The artist, in his more than 25 years career, has managed to capture in film the best moments of those innovators (musicians, lead singers, song-writers etc) who revolutionized Greek music – and the accompanying texts by Aris M. explain the revolting impact of a fresh sound and verse to a society oppressed by the royal USA-supported regime of the period.